In the Legend of the Holy Grail, the Grail King is wounded, necessitating a search for the legendary Grail holding the blood of Christ which will restore him. The Kingdom is stricken, the farmlands dying, the communities suffering, with everything reduced to a virtual wasteland. So it is with many people who hear but do not heed “The Calling.” They live, as T.S. Eliot so eloquently described, in the Wasteland. When you fail to heed your true calling – a message directly from your soul – you live someone else’s life – your church’s, your family’s, your society’s. You become subject to the world of “Thou Shalt,” living without initiative or passion, doing only what you have been told you must do – not what you were born to do. 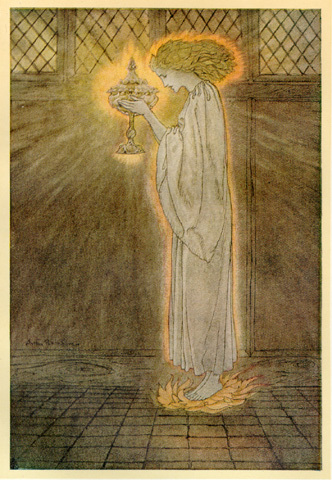 Refusing to listen to the Calling from your Soul leads to much unnecessary pain and anguish (as the knight Parsifal experienced in the Grail Legend). But heed your calling, listen to and embrace the music from deep within your soul, and you will begin to embark on the incredible journey you came to this world to experience – and you will serve something far greater than yourself.